With the holidays approaching, you might be planning trips to visit friends and family across town or across the country. Or maybe you’re staying home for the holidays. Either way, your house could be a target for robbers during this busy time of year. How can you avoid any break-ins while you’re home or away without stress during this joyous time of the year? Installing a smart home security system will help give you peace of mind that your property in the Redondo Beach, CA area is safe at all times. Learn more about this smart solution’s many advantages and qualities by reading below! Whether you’re away at a relative’s home or upstairs in your bedroom just before falling asleep, checking in on your property’s status can be effortless. 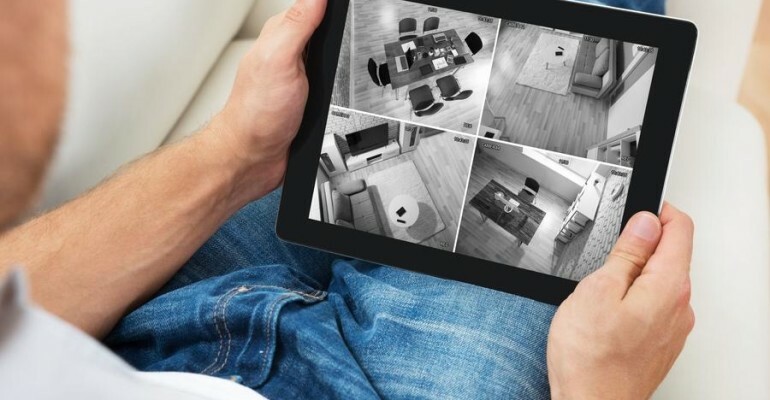 It’s as simple as picking up your smartphone and watching real-time footage from your home surveillance cameras right on your screen. For each camera throughout your property, you can watch footage live or save videos to view later. How? It’s as simple as logging into an application on your personal smart device and tapping on the camera you want to view footage of. Integrating smart locks and doorbells as part of your surveillance system makes going away effortless as well. You can know the moment your neighbors come by to check in on your pets or plants by receiving an instant notification to your phone. When you view your front door’s live camera footage, you can then unlock your smart locks or give them a code to enter so only they can come in. You can even adjust the lighting control on your front porch to create a more welcoming atmosphere for them. You have constant control over who enters your house at all times. Additionally, your front-door video doorbell also can come equipped with motion-sensing technology that can send you an instant push alert when someone is at your front door. This can be especially useful if you often have packages left at the front door over the holiday season – deter any potential thieves and take quick, necessary action if someone tries to steal your property. Instant notifications are handy in many ways. They can immediately let you know if your family is in danger; whether from a burglary attempt or even an in-home hazard. Through adding smart alarms to your property, including security alarms, smoke detectors, carbon monoxide detectors, water leak sensors and more, you can receive a push notification sent to your smart device of choice or an email the instant one of those alarms are triggered. Those valuable seconds can be the difference between saving your property and losing it – even if you plan to be far away from home this holiday season. Of course, some of those alarms might also notify authorities in case you can’t take immediate action. But with the ability to always stay in-the-loop at your home in the Redondo Beach area, you can take smart home security into your own hands. Every feature and component of your smart security system can easily be managed from any place across the globe with an internet connection. Right from your smart device – whether it’s a smartphone, laptop, or tablet – you can operate the system and make any changes needed. Did you arm your alarms? Turn off all your lights? Don’t let these worries accompany as you pack up the car and head to visit your family and friends for the holidays. Even if you left every door unlocked, you can amend any problems with just a simple push of a button if you add smart locks. Want to learn even more about bringing a top-notch smart home security system to your property this holiday season? Give us a call or fill out our to schedule a no-obligation consultation with our team.